Previous surgery in the abdomen or pelvis or radiation to the area increase your risk of complications. Doctors recommend that you quit smoking before surgery. You may also need to take antibiotics to prevent infection and laxatives to clean out the bowels. The night before, you may be asked not to eat anything and only drink clear liquids. After midnight and on the morning of the procedure, do not eat or drink anything. This includes avoiding clear liquids, coffee, tea, and water. An incision will be made in the abdomen to expose the bladder. All blood vessels to the bladder will be cut. The bladder will then be removed. 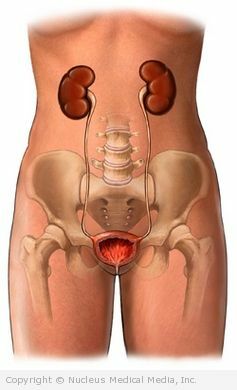 Other tissues and organs may also need to be removed with the bladder. The doctor will also need to create a new way for urine to be passed out of the body. A new bladder may be built using pieces of intestine, or an external bag may be attached to the abdomen. Radical cystectomy – How Long Will It Take? Radical cystectomy – How Much Will It Hurt? Anesthesia will prevent pain during the surgery. Recovery is usually painful. Your doctor will give you medicine to help manage the pain. The usual length of stay is 5-12 days. The specific length will depend on your condition and the reason for surgery. Your doctor may also choose to keep you longer if complications arise. A stay in the intensive care unit for 2-3 days may be needed. During surgery, a tube will be placed from the nose to the stomach. It will remain in for several days. Since you cannot eat with the tube in place, you will receive IV fluids. If a urine bag was attached during the surgery, you will be taught how to dispose of urine. Strenuous activity should be avoided for 4-6 weeks. Avoid heavy lifting, straining, and sexual activity for a period of time. Driving and climbing stairs is usually allowed. Ask your doctor about any restrictions.